We had so much fun last year that we thought we’d do it again. 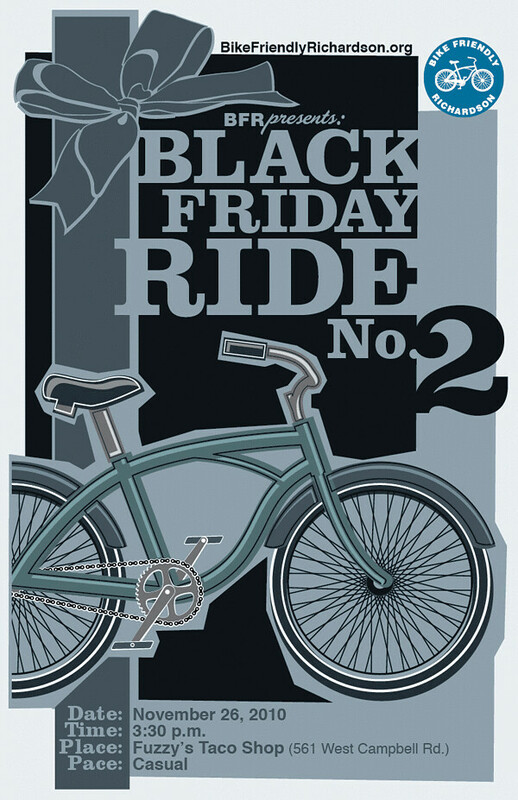 Bike Friendly Richardson presents Black Friday Ride Number 2. There are 30 days of holiday shopping between Thanksgiving and Christmas. Why venture out and deal with the crowds on the busiest retail day of the year? Why mess with busy parking lots, long lines and people fighting over the last of the Sing-A-Ma-Jigs? Instead, take the afternoon off and have a nice bike ride in Richardson. We’ll meet up at Fuzzy’s Taco Shop on Campbell, and do a casual lap through town. The route will let you experience different parts of the Richardson Bike Plan, including neighborhood streets, hike and bike trails and some of the new bike lanes. Check back for more details and route map. RSVP: IF you are on Facebook, Click Here to let us know that you plan to attend.